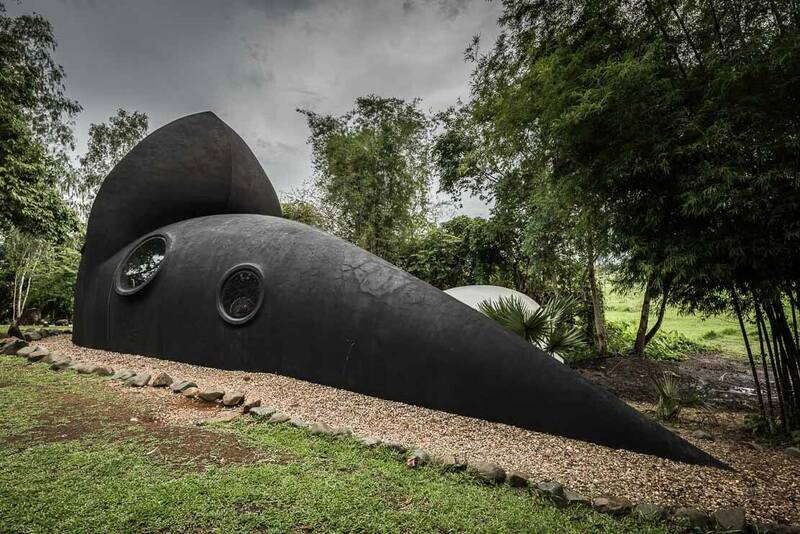 The Black House is one of the most unusual, weird and surreal masterpieces in Thailand. If the better-known White Temple gives an image of heaven, the Black House is full of death. 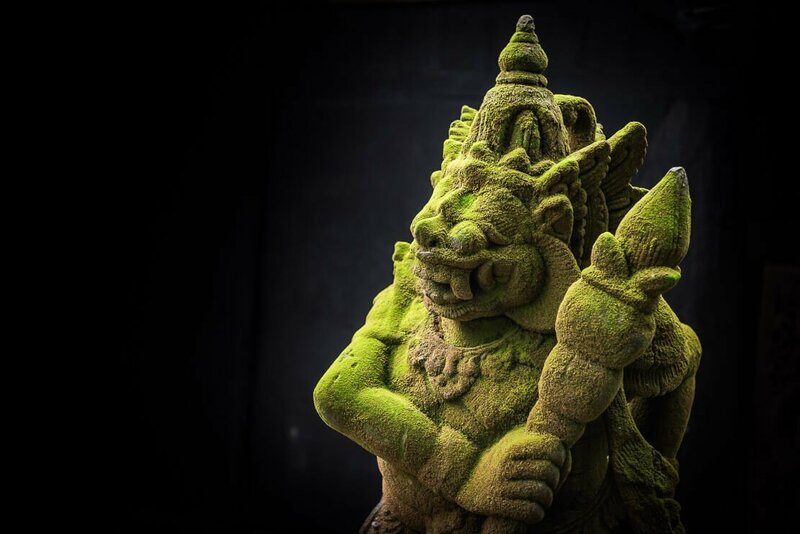 Chalermchai Kositpipat, the architect of the world famous White Temple, definitely dares to think boldly. 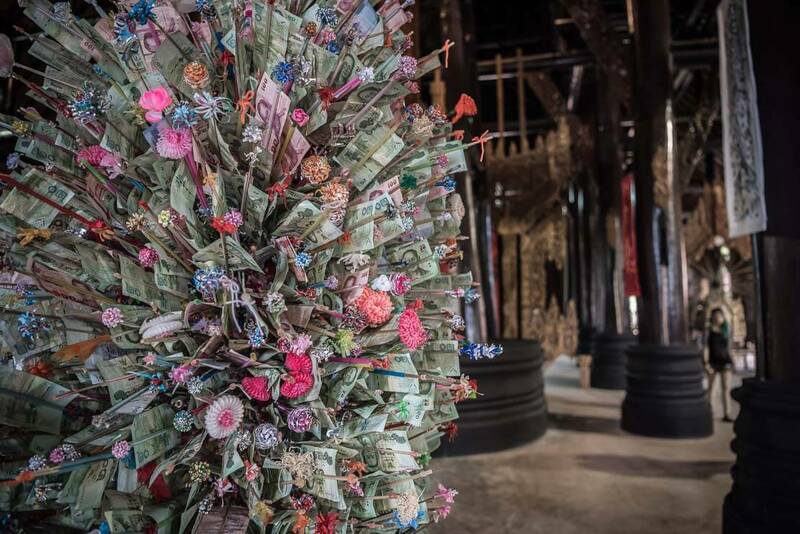 But he isn’t the only Thai artist who doesn’t like to be confined within the framework of the traditional art. 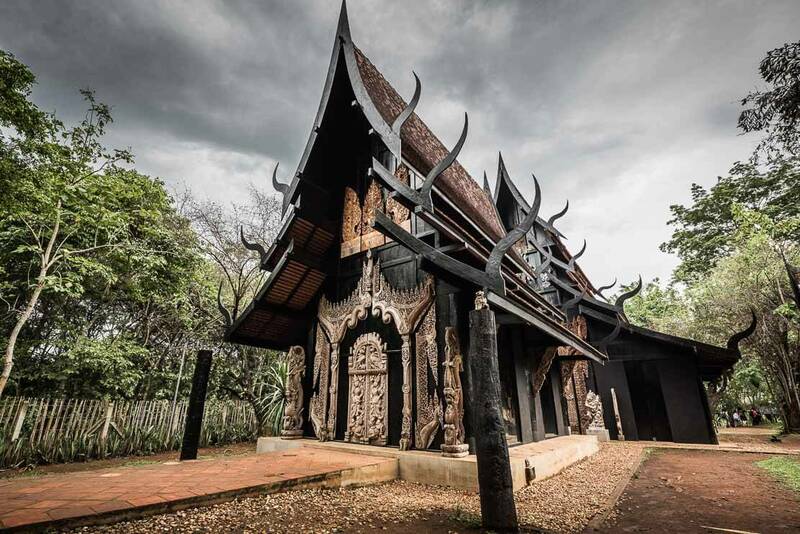 The Black House is one of the most unusual, weird and surreal masterpieces in Thailand. If the better-known White Temple gives an image of heaven, the Black House is full of death. 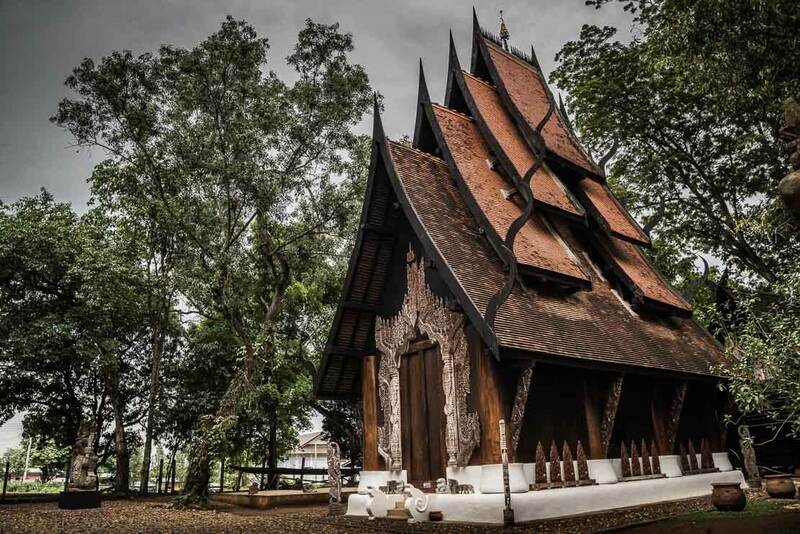 Both structures are creations of the local artists from Chiang Rai. 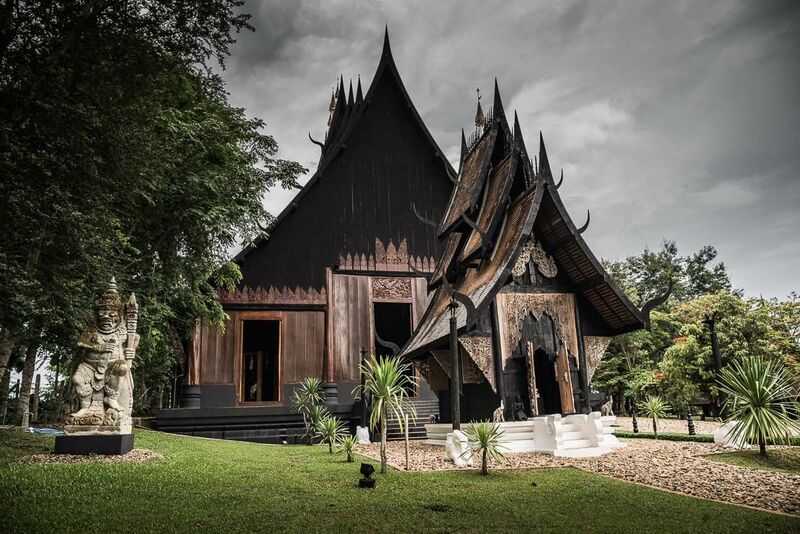 The Black House is the White Temple’s counterpart. 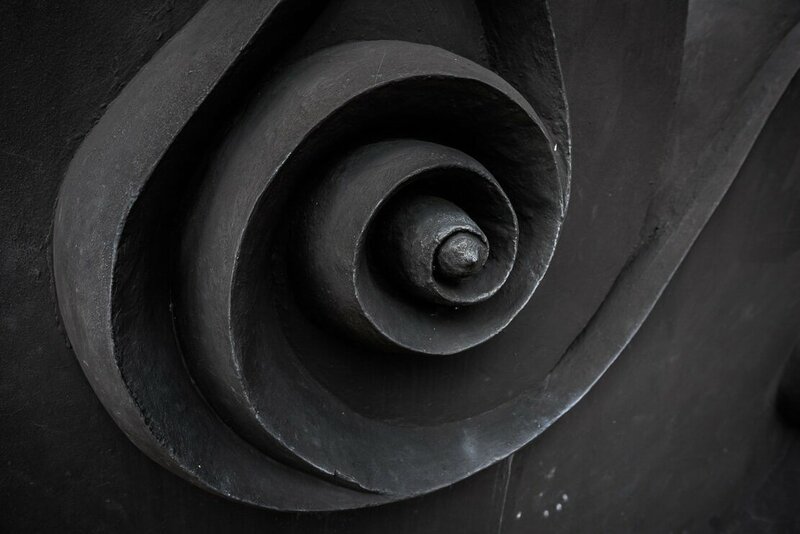 In contrast to the white Wat Rong Khun, it’s black and dark brown. In Thai, “baan” means house and “dam” means black. 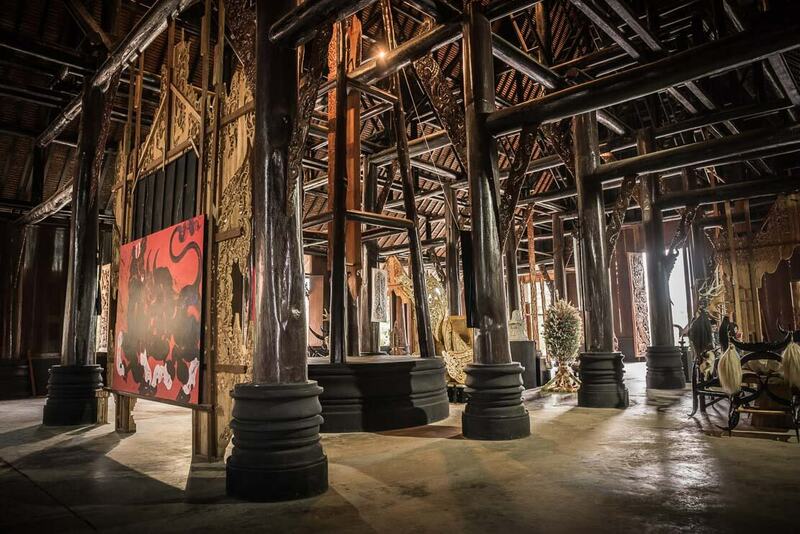 Although Baan Dam is referred to as the Black Temple and despite the temple-like appearance of its main building, it doesn’t have a religious significance. 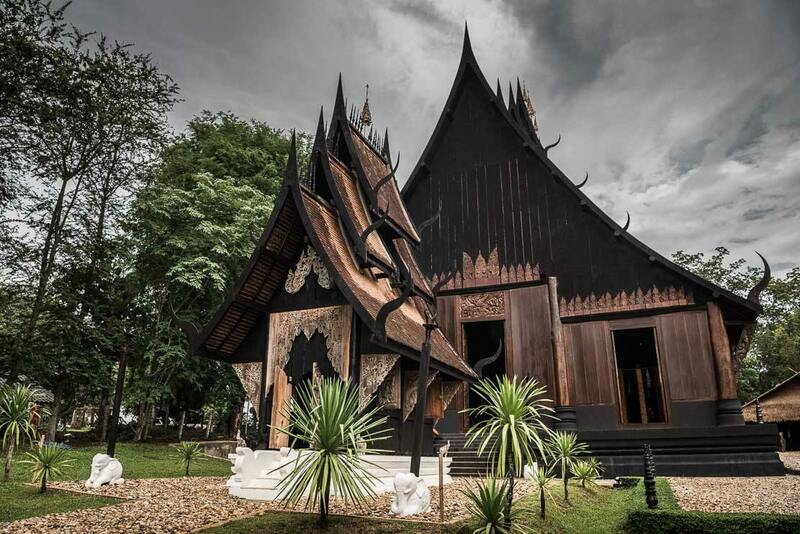 The Black House is the creation of the local artist from Chiang Rai Thawan Duchanee. Thawan Duchanee hasn’t always been popular. 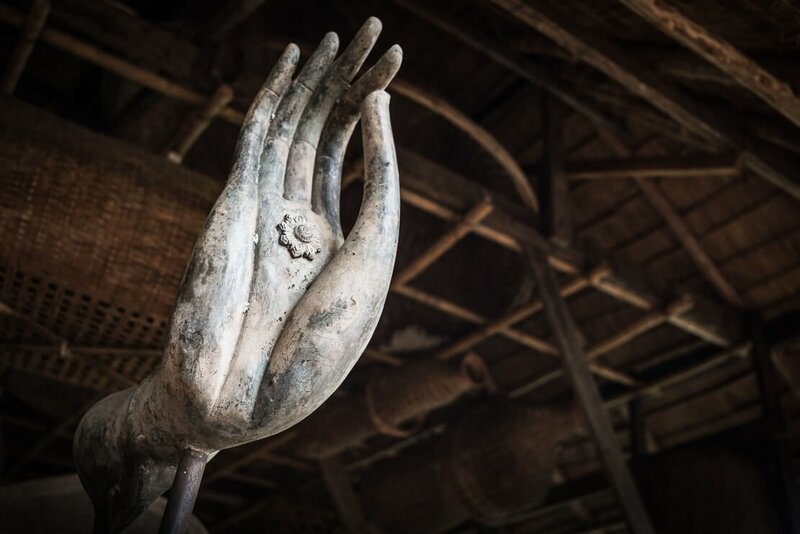 His controversial art shocked the conservative Thai society, and he was accused of disrespect of Buddhism. 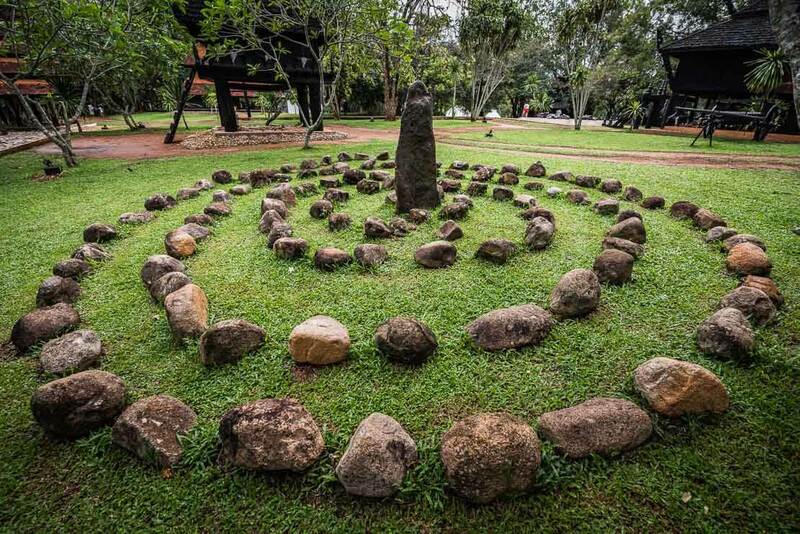 Although heavily criticised in his early years, Thawan Duchanee has been honoured as a National Artist of Thailand and has received the international recognition. 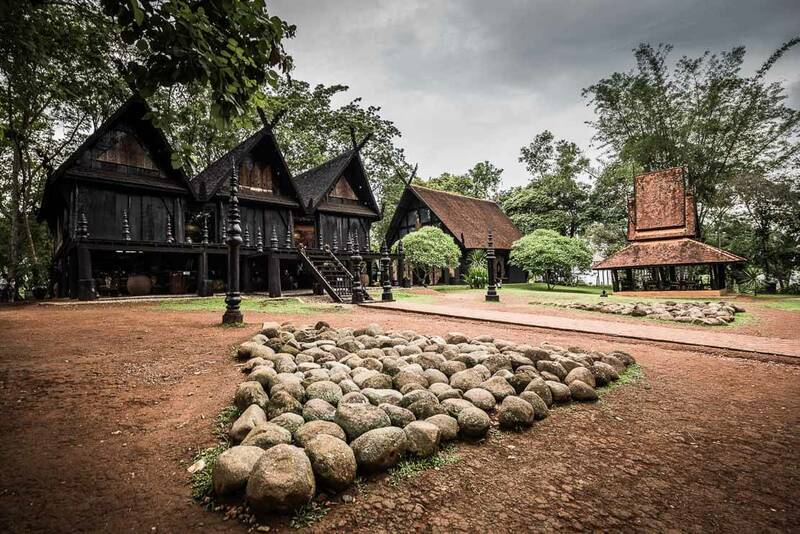 Thawan Duchanee started the construction of Baan Dam, or the Black House in 1976, and it’s still a work in progress. 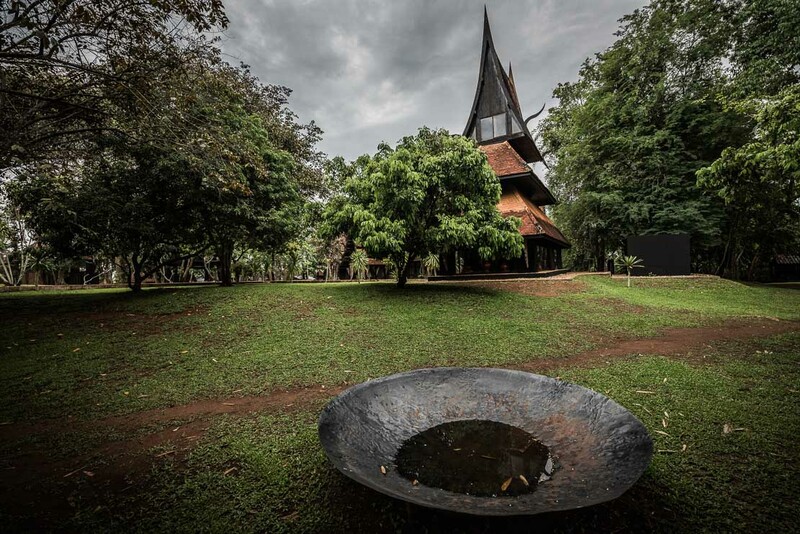 The artist used Baan Dam as his art studio and home. 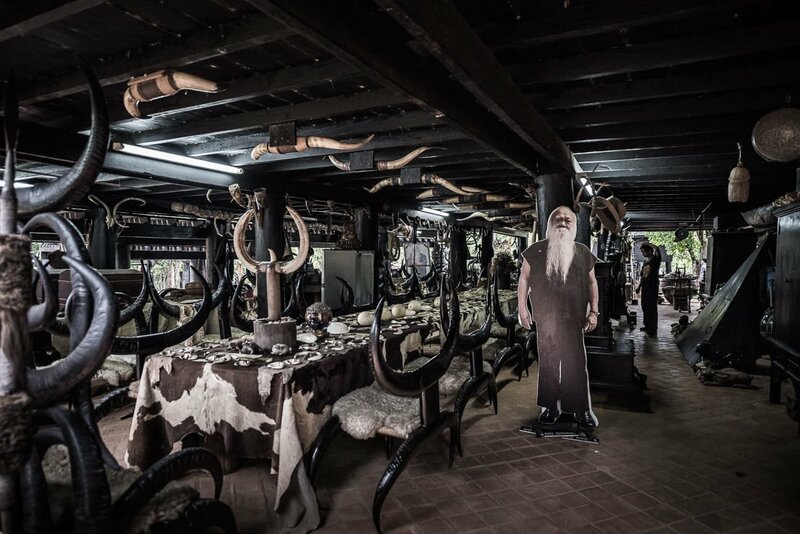 Now it serves as a museum showcasing his surreal work. 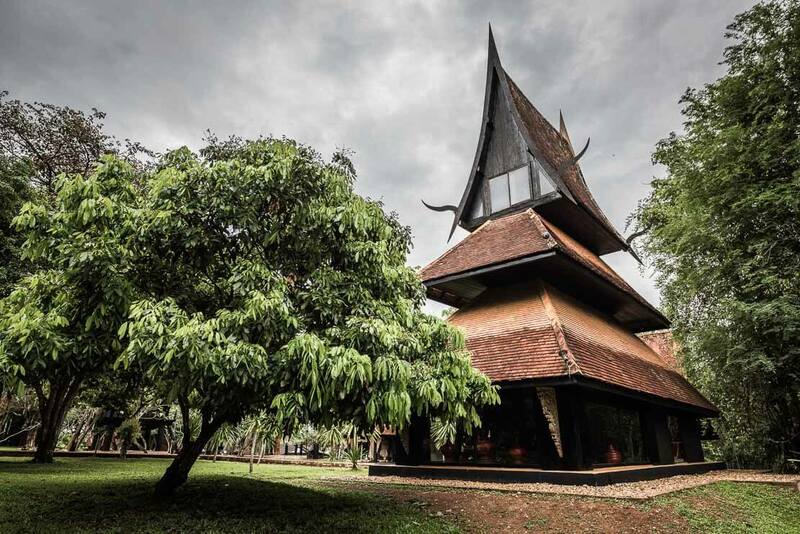 The Black House is not just one structure but a collection of forty buildings of various shapes and sizes located in a peaceful garden. The more you wander around, the more discoveries you make. 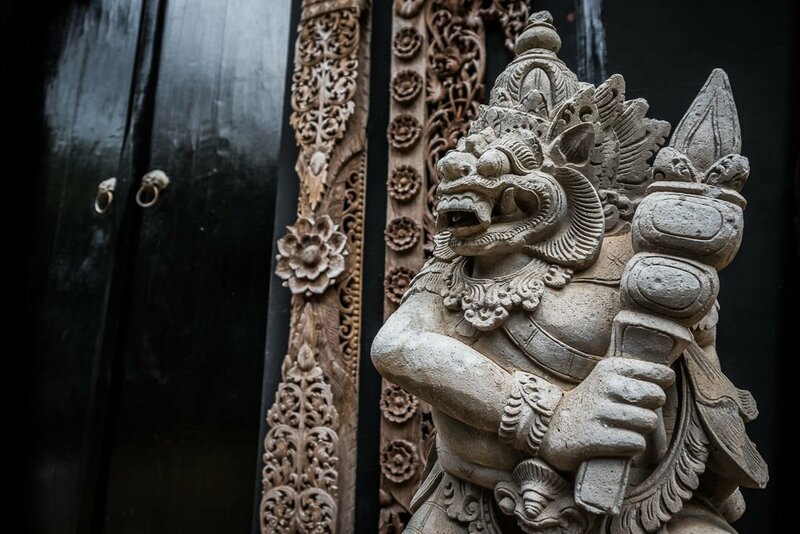 Every corner brings a new surprise – you never know what you will stumble upon next. Although we spent one afternoon visiting Baan Dam, we could have easily spent the whole day wandering around. The Black House complex has many temple-looking buildings and open-air structures. 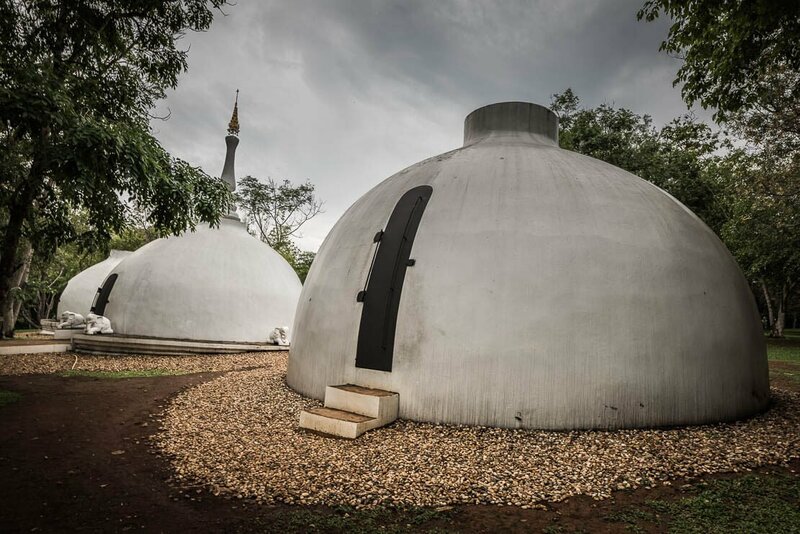 There are also circular-shape white buildings and a building in the shape of a whale. 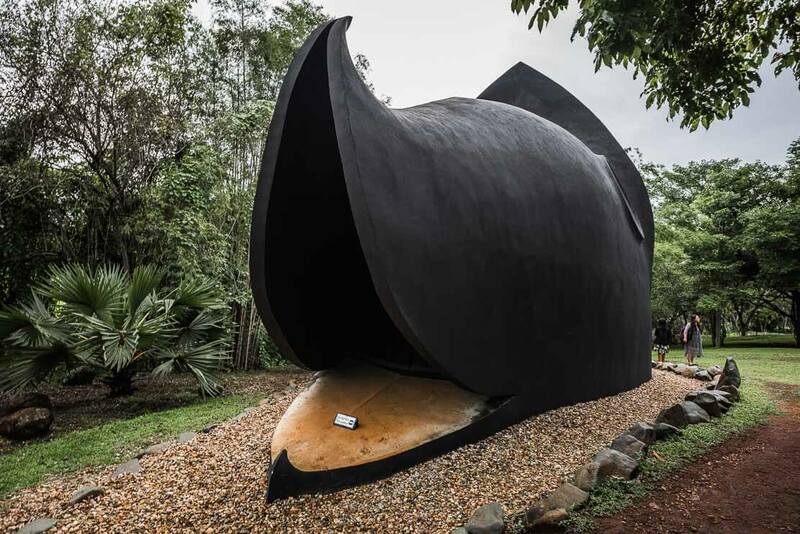 Some buildings are closed to the public such as a whale-looking building, the artist’s former home. But you can peek inside through its windows. 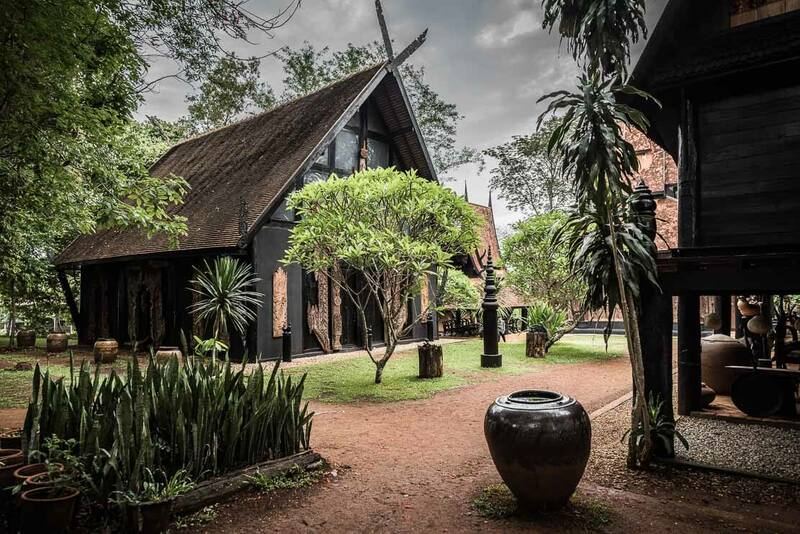 Despite the differences in the style of its buildings, the Black House complex has a unique style with its predominantly black colour and animal remains. 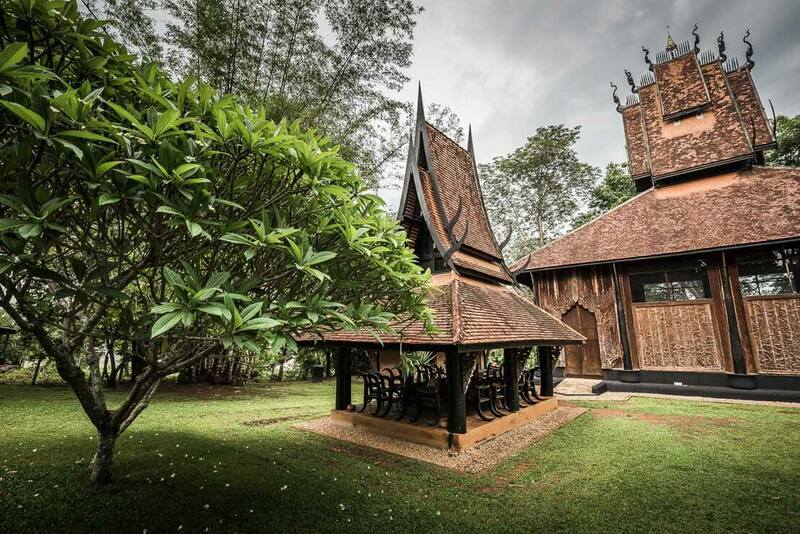 For his creation, Thawan Duchanee combined the elements of traditional Thai architecture with some contemporary ideas in a unique way. 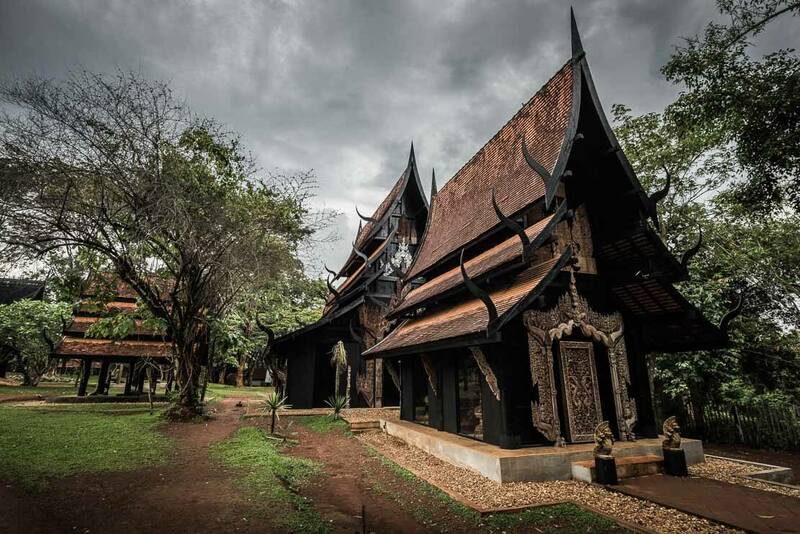 The main building, a large wooden structure located by the entrance, resembles a traditional Thai Buddhist temple with its multi-tiered roof in Lanna style, imposing doors, a Buddha statue, and carvings of nagas. 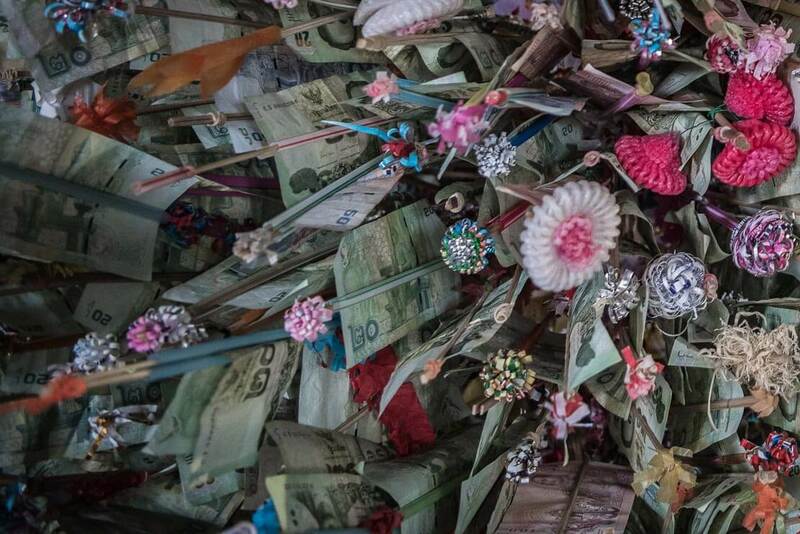 But once inside, you quickly realise it’s anything but a temple. 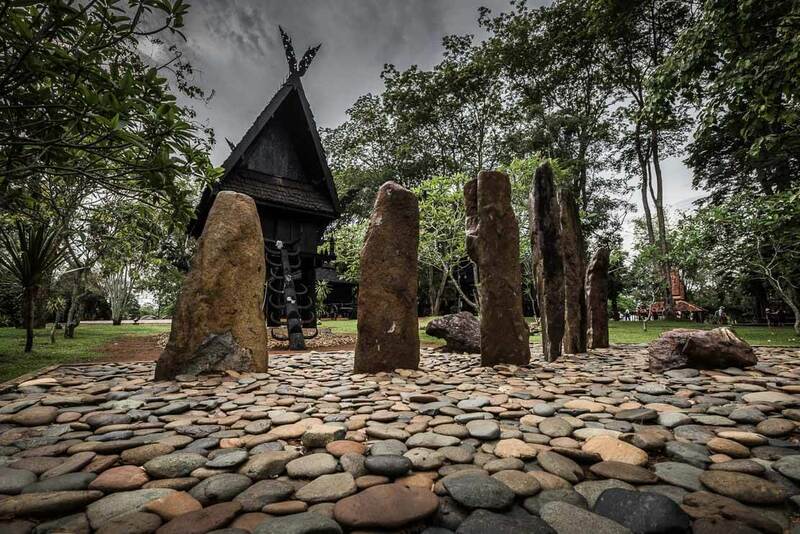 A huge wooden table, as coming from the time of the Vikings, attracts your immediate attention. 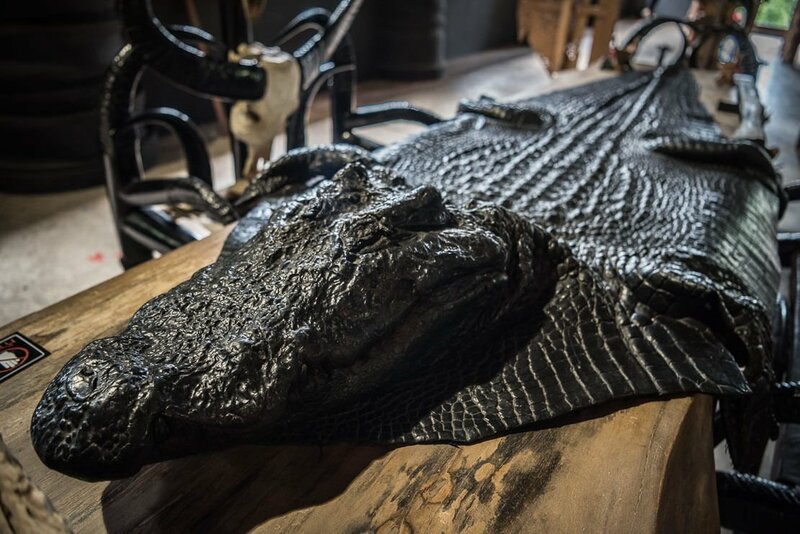 The table, surrounded by massive black chairs with legs made from buffalo horns, is laid with snake and crocodile skins as table-runners. 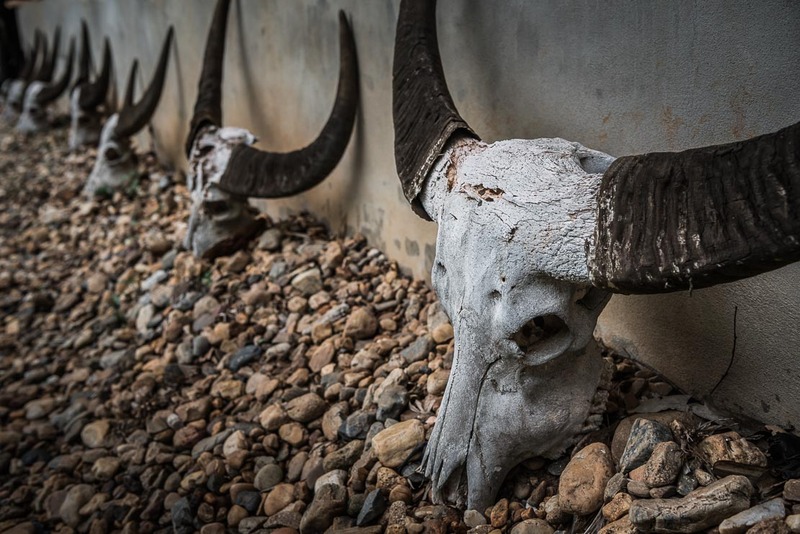 Wandering on the Black House grounds, you are constantly coming across animal remains. 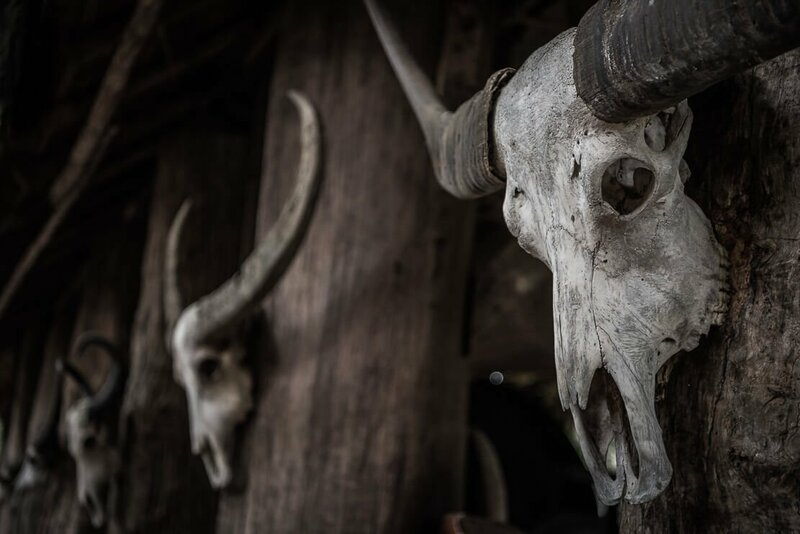 Animal skins, skulls, furs and bones are everywhere. 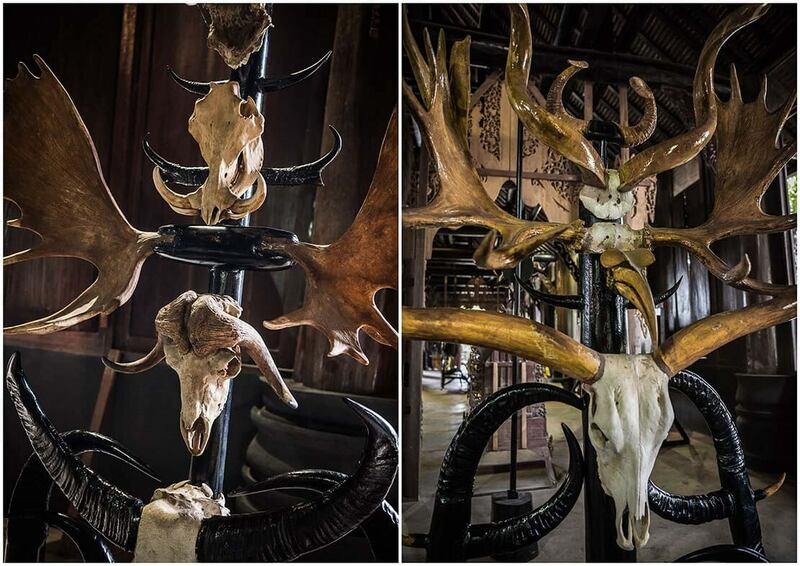 There are also intricate wooden carvings and chairs made from buffalo horns. 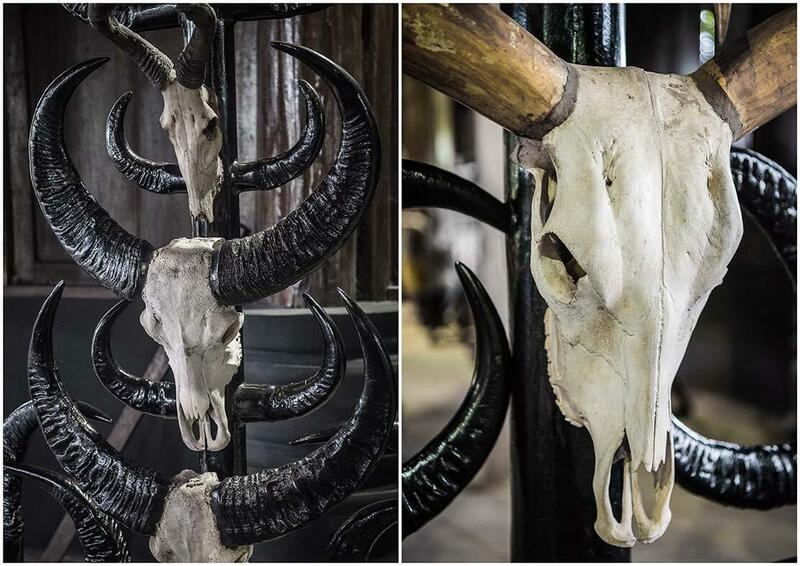 The black colour, sombre interiors, and dead animals create a dark and mysterious atmosphere, and a feeling of evil. 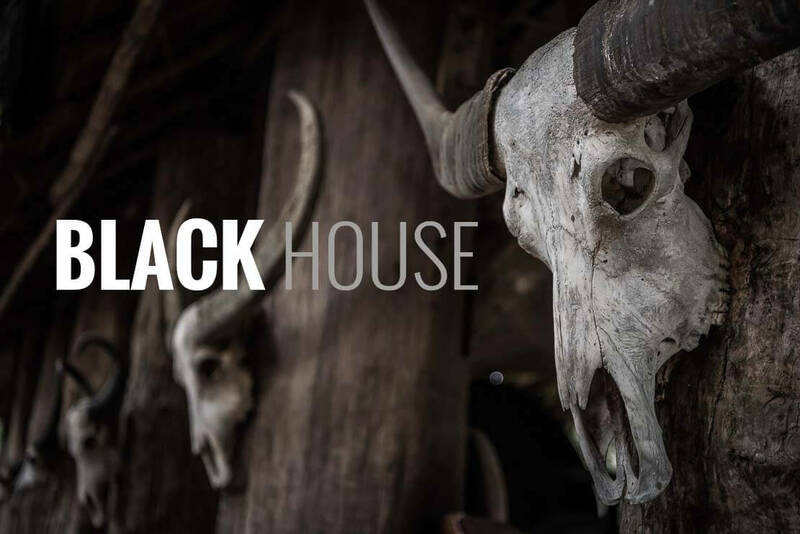 According to some opinions, the Black House with its animal remains represents the sufferings on Earth, sickness, and death. It portrays the darkness of humanity and hell. 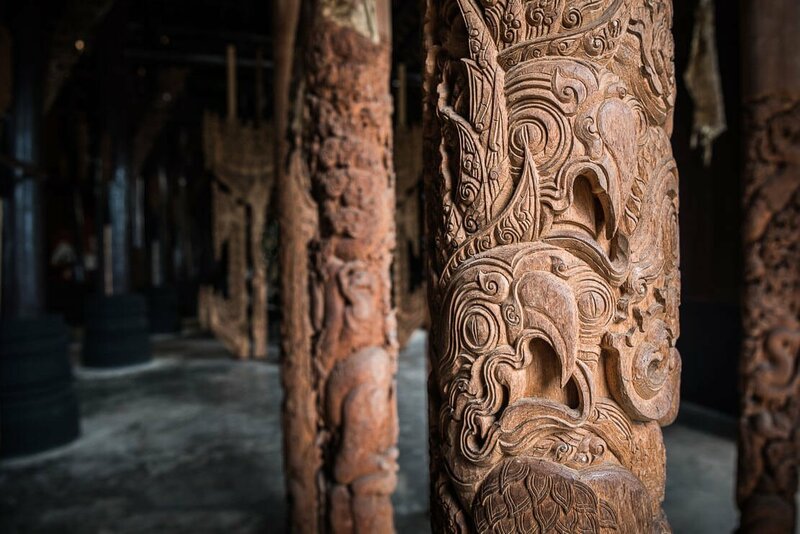 However, the artist didn’t intend to create a Hell Temple (as the Black House is often referred to) but a place to showcase his artwork. 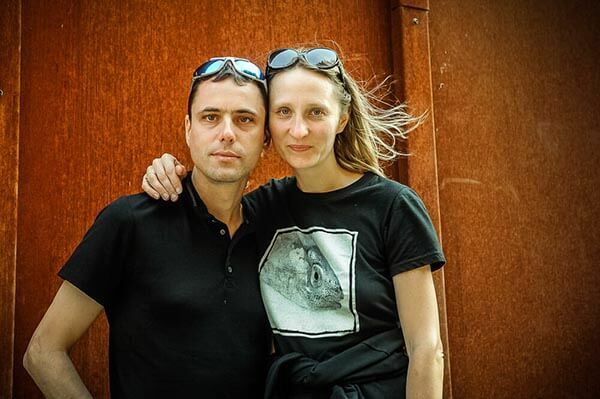 Weird, bizarre, creative, surreal, provocative, creepy are descriptions easily applied to the Baan Dam, or Black House. 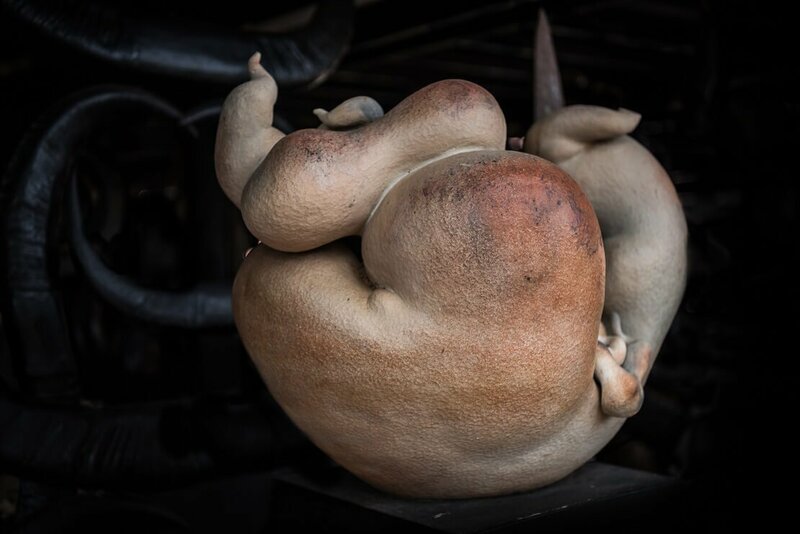 You may like it or not, but you cannot deny that Baan Dam is a unique creation left to us by the artist who died in 2014 at the age of 74. 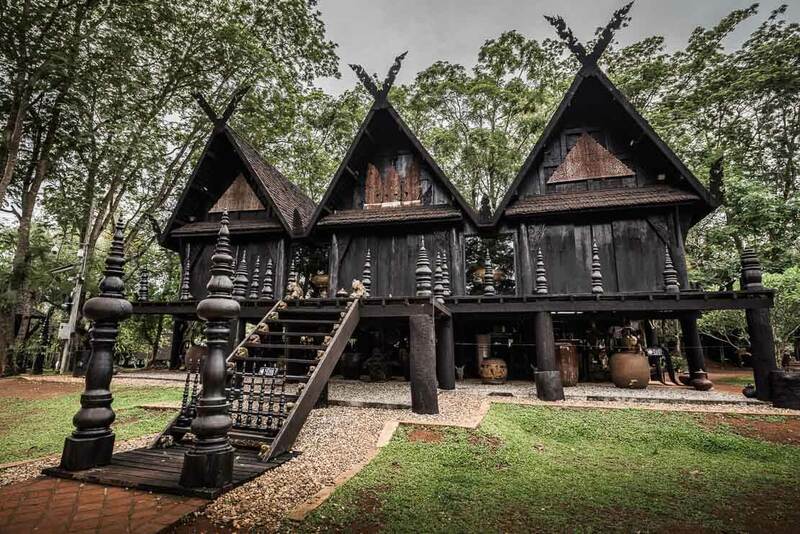 Location: The Black House is located 10 km to the north of Chiang Rai city. 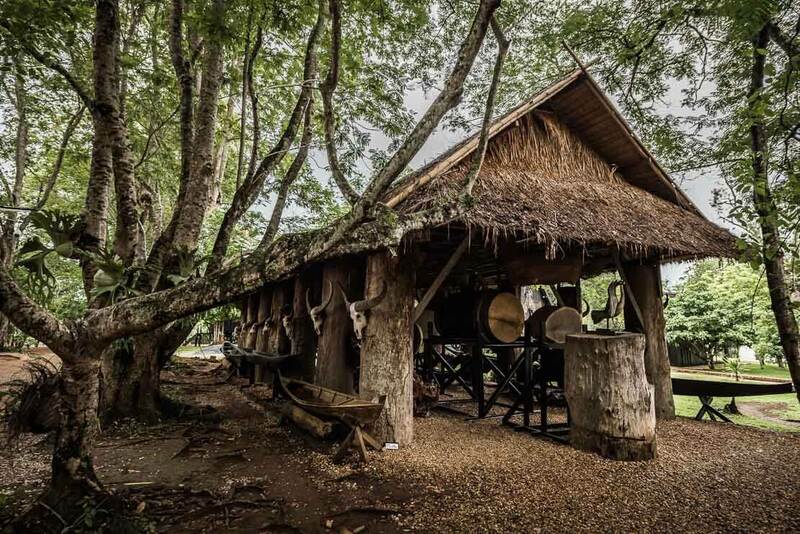 Transportation: The Black House can be reached from Chiang Rai by bus from the old bus station, by tuk-tuk, by car or by motorbike (the most convenient option). It’s 20-25 min drive by motorbike from Chiang Rai and about 30 min drive from the White Temple. 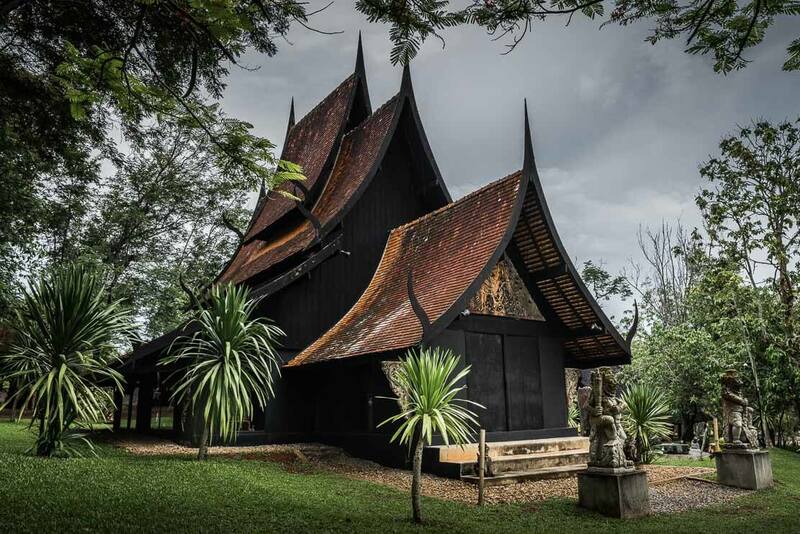 You can also book a shared tour, which often combines the Black House with a visit to the White Temple. Additional information: The Black House is closed for lunch from 12 noon to 1pm.